From early December through to early April the whole area around Bagneres-de-Bigorre is popular for skiing. 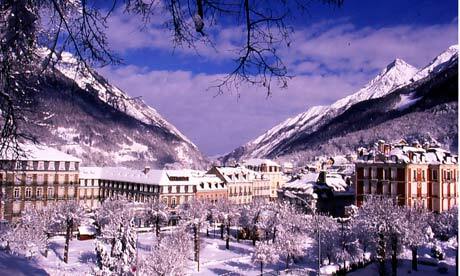 La Mongie, the largest ski resort in the French Pyrenees, is only 30 minutes drive from Villa Tamerza. The resort offers 6 black runs, 21 reds, 19 blues and 23 greens, plus off-piste skiing. Beginners can learn at a purpose built ski school area and enjoy the mountain using the extensive network of green and blue runs. There are also 5 or 6 other smaller resorts which are within 1 hours drive, including St Lary Soulon, Cauterets and Hautacam and cross-country skiing around the beautiful lake at Payolle, halfway up the Col d'Aspin. 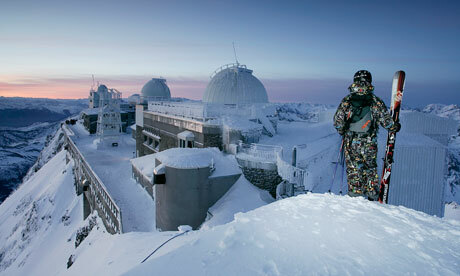 These resorts have skiing for all abilities and are rarely crowded. There's often a supervised creche area for young children and an extensive ESF ski school for private or group lessons. ​It wasn't the usual airport transfer. We bumped along in the back of a friendly stranger's battered old jeep, the resident cocker spaniel having obligingly moved to sit on his owner's lap in the front seat. But our shuttle driver had decided that rather than risk climbing further into the mountain blizzard without chains, it was wise to flag down a passing vehicle and charm them into giving us a lift, which this stranger did willingly, ushering our bags and us into the dog's place with a delighted smile. "That's so Pyrenean," declared our French hosts, after my friend and I were dropped off safely at the bar of Le Bois Joli in Cauterets. It may not happen in Geneva, but then, like so much about skiing in France's south-west rather than the Alps, it wasn't just different, but more fun too. Resorts here usually flag up the multitude of snow machines that help ensure skiing through the season, but any fear that snow might not fall at the lower Pyrenean altitudes was unfounded this season. The opposite was true: there was more snow here than in any other resort in the world by mid-February. So much, in fact, that it caused problems of its own: ski lifts submerged under nearly six metres of the stuff, pistes overflowing faster than the piste-bashers could flatten it, and such persistent snowfall that the avalanche risk could not be managed, leading to closed runs and even closed resorts. We'd glimpse the odd buried snow machine, as redundant as a fan heater in the Sahara. At Cauterets, the outermost pistes on the mountain bowl were closed, partly for fear of avalanche, but mainly because only the roof of the chairlift station remained visible. The weather deprived us of the view of the renowned national parks on the other side: the Pont d'Espagne's access for snowshoeing or crosscountry skiing among forests and teeming waterfalls' also blocked. But it would be churlish for any skier to curse the snow. For the willing but inexpert off-piste skiers, like my friend and me, there were rare opportunities here and in nearby La Mongie and St Lary to try skiing through deep, fresh snow - often, in fact, on runs that overwhelmed pisteurs couldn't groom in the exceptional conditions. The Pyrenean resorts are quite family-oriented, and the average skier here, mainly from western France, looks less practised than in the Alps - the Winter Olympics it isn't. But those with the skills could find amazing, virgin snow daily. On one long stunning chairlift ride up the south face of the Tourette peak in St Lary, in a rare morning of clear blue sky, we watched in awe as a skier floated off-piste over the hitherto untouched expanse for hundreds of metres. Energetic skiers will quickly exhaust the possibilities of Cauterets, but lift passes can be used for other resorts in the region including the Grand Tourmalet, the area combining La Mongie and Bareges (through the latter was alas inaccessible and evacuated after an avalanche when we visited). 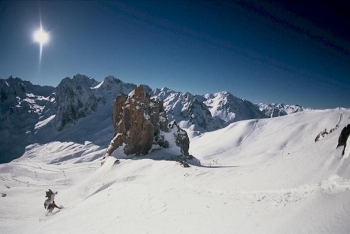 St Lary has a few more exhilarating runs, although the region's most intriguing challenge must be the off-piste descent from the Pic du Midi de Bigorre, north of La Mongie. When weather allows, this mountaintop observatory for stargazers takes a small number of pre-booked guests for the night, to either return by cable car or ski down with a guide. 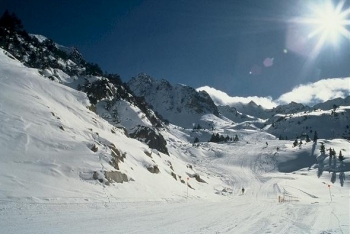 But if the French Pyrenees can't usually beat the Alps for skiing, it has the brilliant, bonus feeling of holidaying abroad, something a ski trip doesn't always manage. If some Alpine resorts can feel a bit like a production line of British visitors, from flights to chalets, with solid English spoken from boot hire to apres-ski, this felt like a warmly welcoming, down-to-earth part of France. Cauterets in particular is a gorgeous old spa town, with grand 19th century architecture fit for the visiting bourgeoisie. Thermal baths using the naturally hot spring water are dotted around the resorts, but the Bains du Rocher at Cauterets, in a renovated traditional building, were special; lolling in the steam of the 35C outside pool after nightfall watching huge flakes of snow swirling down on to our faces felt magical. Not all the buildings are beautiful: La Mongie is one of those purpose-built French ski resorts whose concrete scars the landscape, to the chagrin of the fiercely proud locals in the tourist office, happy to tell how bears and the Occitan language were all but obliterated by Parisian overlords. But the mountains are magnificent: and you can still dine at a cracking traditional hut near the top of the slopes, L'Etape du Berger is owned by yes, a real shepherd, Eric, who breaks off from tending his 2,000 strong flock to spend a long lunchtime entertaining guests and sharing out hunks of lamb with quick expert incisions. The restaurants in general served great, hearty food: the south-west's typical duck dishes, and Gascon speciality garbure, vegetable broth laden with sausage, pork and duck leg. We tried stag and wild boar at Les Trois Couronnes in Cauterets, and more garbure at L'Auberge des Pyrenees in Sainte-Marie-de-Campan (whose proprietors kindly took us in after we were forced down the mountain by the elements). 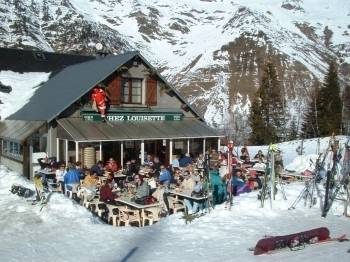 At La Tutein St Lary ordering soup and salad turned out to mean far more food than even a hungry skier could put away. And as you'd expect, there were big Madiran red wines everywhere to wash meals down with, and all at very decent prices, certainly for ski resorts. The vodka-based bilberrydigestifs are maybe more of an acquired taste.Only around 1% of visitors here are British: I'd met one in the queue for the plane, who inquired if I was going skiing: he'd been coming this way for years, had loved the welcome from the locals, and was baffled why more people didn't go there. Then he stopped, as if he'd let out more than he wanted to tell. The 6.20am flight from Stansted to small, fuss-free Lourdes airport meant that with a one-hour transfer (even by stranger's jeep) we were skiing that same morning. I don't know why more people don't go either.